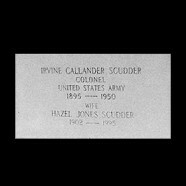 It is believed that Irvine Scudder served in World War I, and continued to serve in the military until his return from being a prisoner of war in the Philippines after World War II, in 1945. Colonel Irvine Scudder, served on Cebu as part of the Visayan forces headquarters, and was commander of the troops there, some 6,500 men, that included the 82nd and 83rd infantry (PA), the Cebu Military Regiment, a Philippine Army Air Corps detachment, and miscellaneous units. His commanding officer was Brigadier General Bradford Chynoweth whose strategy for war much different than the that of General Sharp and, for that matter, General MacArthur who believed that beach warfare was the answer to stop the Japanese invasion of the Philippines. Due to General Homma’s preoccupation with Bataan, the Visayan Force was allowed an additional month to make preparations for war. On Cebu and Panay, where the defenses were more elaborate, the men had constructed tank obstacles, trenches, and gun emplacements, strung wire, and prepared demolitions. Airfield construction was pushed rapidly on all the islands. General Chynoweth adopted Operation Baus Au, which was the movement on a large-scale of supplies, goods and weapons into the interior for later use in guerilla warfare. The supplies were hidden off of trails, in mountain hideouts and within areas that could be reached only by steep, narrow trails barely passable for a man on foot. These hiding places also provided security for the troops that might need to fall out and regroup before going into combat with the advancing Japanese, or to make a surprise rear charge of the enemy. This strategy also gave the Allied Forces, both American and Filipino troops, an opportunity to learn the strength of the army they were up against. General Chynoweth . . . opted to operate by bringing the Japanese to them wherever they were, in the mountains, along trails, anywhere that they could provide a surprise guerilla attack, thus giving them a chance when they were outnumbered and out supplied. On April 4th, 1942, Major General Kiyotake Kawaguchi had little reason to fear the outcome for the Kawaguchi Detachment, the 14th Army support and service troops, headed for Cebu. On April 9th, while General Chynoweth met with his staff and unit commanders, three Japanese cruisers and eleven transports were steaming to the island. These troops separated with the force, part heading for the east coast, and the remainder headed for the west coast of the island. War had come to Cebu. “When General Chynoweth met Colonel Scudder, whom Sharp left in command on Cebu, he was short, sturdy with flashing blue-gray eyes. He looked like a soldier. He was busy on the phone, getting reports of an enemy landing South of Cebu. At that point Scudder had from ten to twenty rounds of ammunition per rifle for defense of the island. The general asked Scudder if he could stop the invasion with fifteen rounds per rifle. He flashed his eyes, shrugged his shoulders, and smiled. There was no other ammunition except for the ten million rounds that were now stored on the Cebu dock, with the final destination being Corregidor. Colonel Cook, the man in charge of the dock and supplies, was asked by the general if he could get the ammunition to Corregidor. Cook agreed he could not. And was then ordered by Chynoweth to turn over a half-million rounds immediately to Colonel Scudder for distribution to the troops. The men (Americans) were headed three-quarters of the way up the island of Cebu, and to the to the Balamban Forest. There, their food sources were stored the east near the Bon Bon Valley Road and a distance from the forest that would be their final command post before . . . Unfortunately, bootleg farmers had cleared many of the forest trees and planted corn. Colonel Scudder and General Chynoweth’s cover was encroached upon by civilization. They now knew what wild animals felt like being hunted when their cover was cleared. The attack of the Japanese combined land, sea and air forces that shattered the Cebu defense structure. The American forces were continually on the move for protection and to preserve was resources they had left – be it men, food, ammunition and other supplies. The continual change in location meant that the commanding officers would move the command post many times until finally they were located near Balamben Mountains. It was necessary for these officers to hike the trails to do so. Unfortunately, Colonel Scudder had a health condition that made it difficult and painful for mountain climbing, but he never complained. Precious boxes and cases of Australian food was moved immediately to the mountains. Here the mosquitoes were terrific. The men would move their command post several times before the end of their service as free soldiers. At suppertime on May 6th, the men heard stunning news. They listened as General Wainwright ordered the surrender of the entire Philippine Islands. General Homma had told Wainwright, “Surrender everything or nothing!” If he refused General Homma would execute everyone on Corregidor. Scudder . . . and the General went into a huddle. They had no law books. They all agreed that the surrender was issued under duress and the order did not apply to them. The next morning Colonel Kawakami demanded they surrender. They did not oblige. Next came another courteous, conciliatory note from Kawakami to comply with Wainwrights orders. General Chynoweth honorably declined to surrender. Scudder and other officers captured in the Visayan Islands were first taken by ship (Maru) to Bilibid Prison on the outskirts of Manilla. Within a few days Scudder and other officers were then boarded on the Hell Ship “Lima Maru” with the destination being Takao, Formosa. There he, with the other officers were taken to Karenko prison camp. 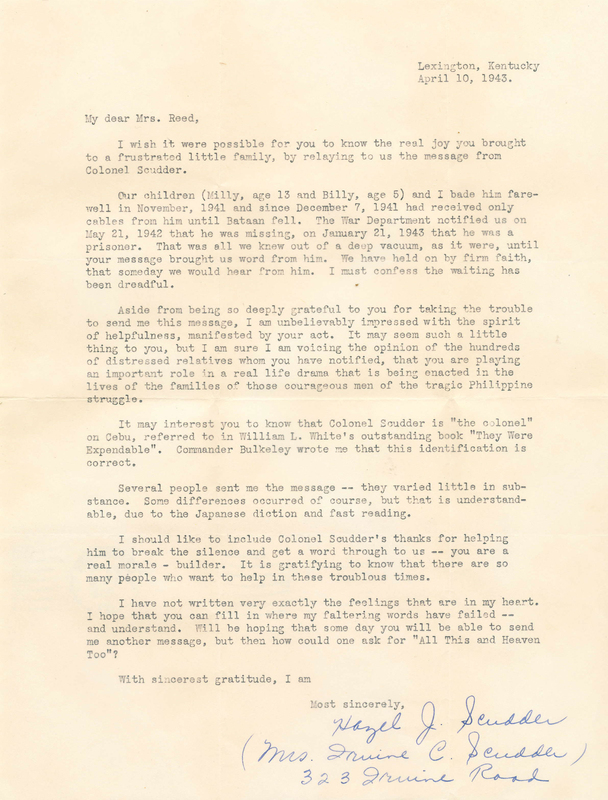 “We had plenty of misery, starvation, and harsh treatment. We lost some of our comrades. These men were taken to Karenko (established August 17, 1942 until June 25, 1943). This camp held senior American officers, governors of Asian colonies and aides. Herding goats and farming was required of them, and this work allowed them the privilege of eating. Later these same officers were moved to Tamazato because of a visit from the Red Cross. This was a ploy by the Japanese to show the men were being cared for adequately. Following this visit, the men were returned to Karenko until its closure. Once Karenko was closed the men, were taken to Shirakawa, Camp #4 on the misquito coast. Here the men were once again engaged in farming. Following their departure, Shirakawa became a military hospital, and the camp remained such until the end of the war. As the war turning against the Japanese, in October of 1944, the men were sent to northern Manchuria, to a place of bitter cold during the winter, to Hoten prison camp at Mukden Manchuria. Here, in Manchuria, the men were liberated by a large unit of Russian soldiers. The Russians wanted to turn the Japanese military personnel over to the Americans for execution, and had a difficult time understanding why they did not want to do so. The Americans saw the execution of their guards as a solution to solving problems. The men were placed on a freighter and shipped to Sian, then later were flown to Kun Ming, China and placed in a hospital for observation. MacArthur wanted the men to return home via Manilla. The next stop was Guam on a C-52, then on to Hickam Field on Oahu, then on to San Francisco and their families.